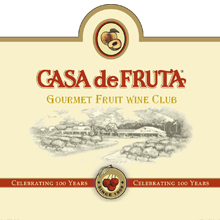 Gourmet Fruit Wine Club sends wine club members quarterly selections of the following wines: Apricot, Blackberry, Pomegranate and Santa Rosa Plum. The membership is a great gift for any wine lover. After you select your Wine Club Package and add it to your cart, continue shopping and add your wine purchase to your cart. Insert the coupon code “WINECLUB” to receive 25% off up to 2 cases of non-sale wine today! Be sure to save your credit card information by checking the box on the final check out page to insure your recurring orders will be placed. The coupon code is one time use only and redeemable only when the Wine Club Package is in your shopping cart.